Norwegian Cruise Line is definitely one of the best cruise hosts in the industry. Embark on a cruise with Norwegian Cruise Line and expect only the best in generous on-board amenities, a catering service staff, and a truly special fleet. RedHotCruises has many types of cruises with Norwegian Cruise Line at fantastic rates. 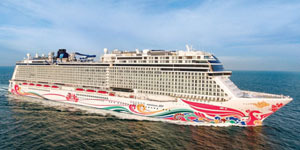 On this page, you can browse all destinations, departures and ships available with Norwegian Cruise Line. Vacancy is often limited, so buy online with us now to lock in your cruise with Norwegian Cruise Line before it sells out completely. Call us at (844)235-4177 or email us to talk with a vacation professional and we will find the perfect cruise for you.